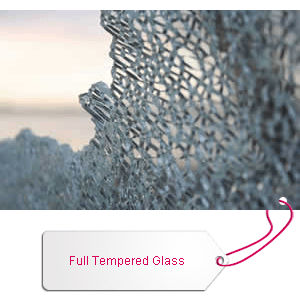 When tempered glass is broken, it shatters into tiny blunt fragments falling off from glass frame or structure. 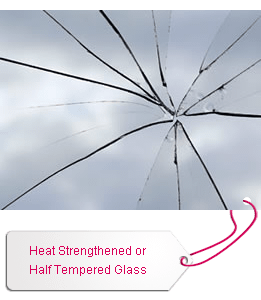 When heat strengthened glass is broken, it cracks into large pieces of fragments which still hold within frame or structure. Due to its characteristic, heat strengthened glass is applied where falling off of broken glass leaving holes on frame is prohibited. Quenching of strengthened glass is less hard than tempered glass. Impact strength of strengthened glass is 2 ~ 3 times than ordinary annealed glass while tempered glass is 4 ~ 5 times than tempered glass.